These classic apothecary jars are sure to put a smile on your guest's faces and bring back fond memories of childhood days. Now you can personalize them with a full color photo or custom artwork of your choice! Fashioncraft offers a new and exciting new idea to customize your favor jars - upload a full color photo or custom artwork of your choice to create a unique and fully personalized label! 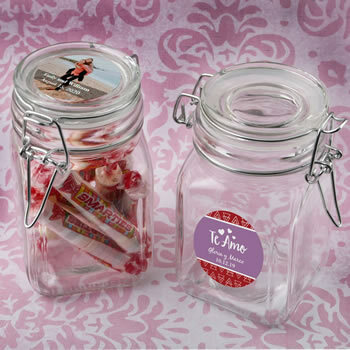 The top lid of the jar is the perfect place to put your personalized label. Choose from an exceptional selection of colors, exciting border designs, different themes and customized titles for any type of occasion and add your name and date. Use our exclusive Design Tool to create your own label and preview it online before you order. The personalized labels are sized at 1.75" and come on easy peel and stick sheets.